Bench vise handles get abused almost as much as the jaws. When it is time for a new handle, you may have an idea how you want to do it yourself, or you can purchase one from me. I want to share the steps I use for building handles. My way is not the only way, it’s just my way. Things to consider are whether the spindle needs any work, which type of steel to use, and the method of knob installation. Communicating back and forth with a customer is so important. It is easy to leave out critical details on the phone or in emails, which kills a lot of time on both ends. That is why I share a drawing with each customer to hopefully clear up any discrepancies or uncertainty. First, I rely on the customer to provide handle specs for the overall length and knob style and even the knob diameter. Then I create a drawing to be accepted by the owner. 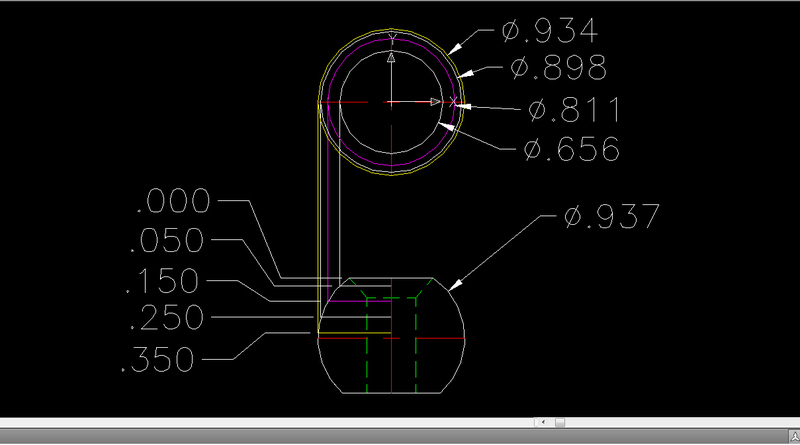 The drawing shows how the handle is made and how the knob will be slid in place with the peening material beyond the knob. 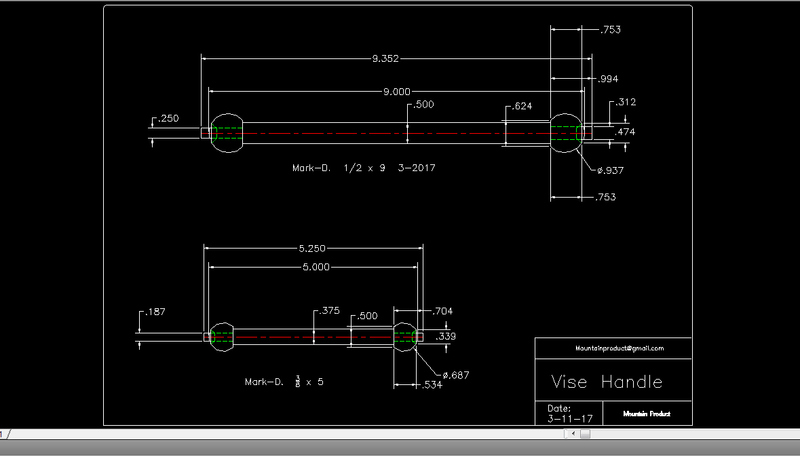 The first area I look at is the spindle handle hole. If the hole is worn from the handle sliding for many years of use, then I consider machining out the hole to the next larger size. 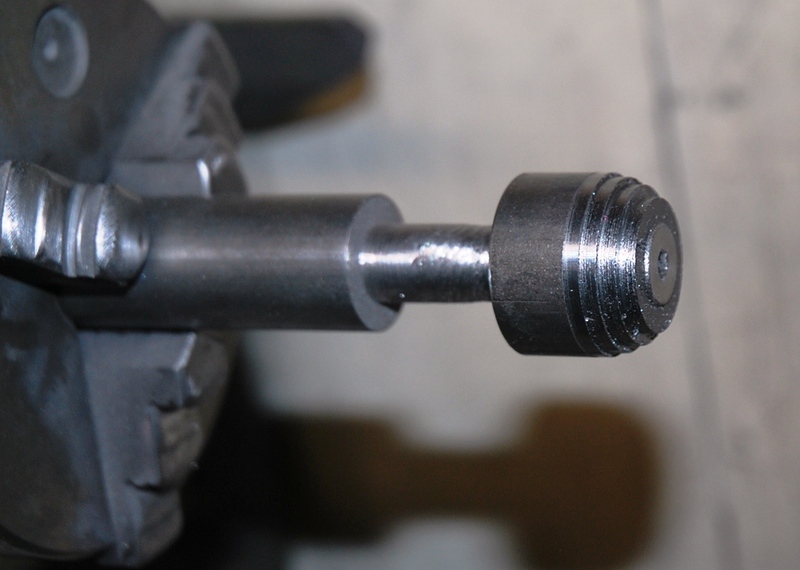 The picture shows a ratchet spindle off a Prentiss that is pretty worn on the sides. It shows that a smaller handle was used and it wore out the edges. It is tricky locating the hole by hand, but with a top reading indicator in my CNC, I can find the center and also align the hole straight up and down. 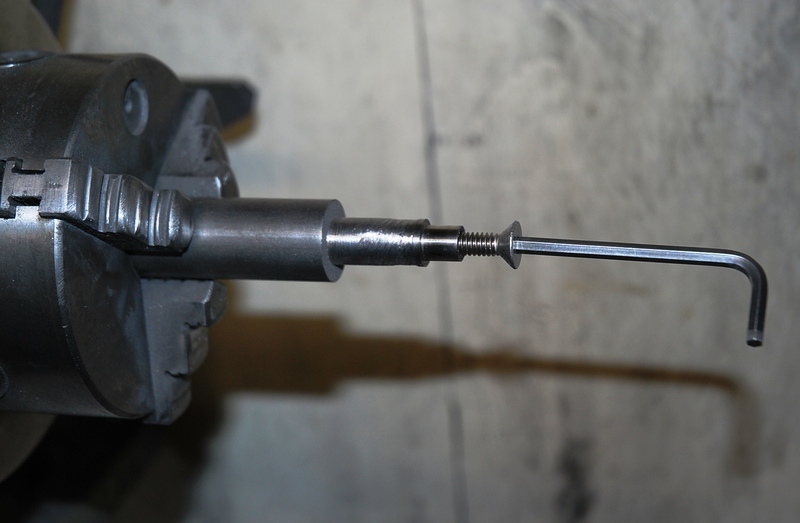 If you miss getting the spindle straight up and down you will not clean up the hole. I like leaving .015 clearance for the handle bar. Next, I begin work on the handle itself. I like using high-strength 1144 carbon steel from McMaster Carr. This stuff is easy to machine but also very strong. It is a little springy, and actually very difficult to bend. 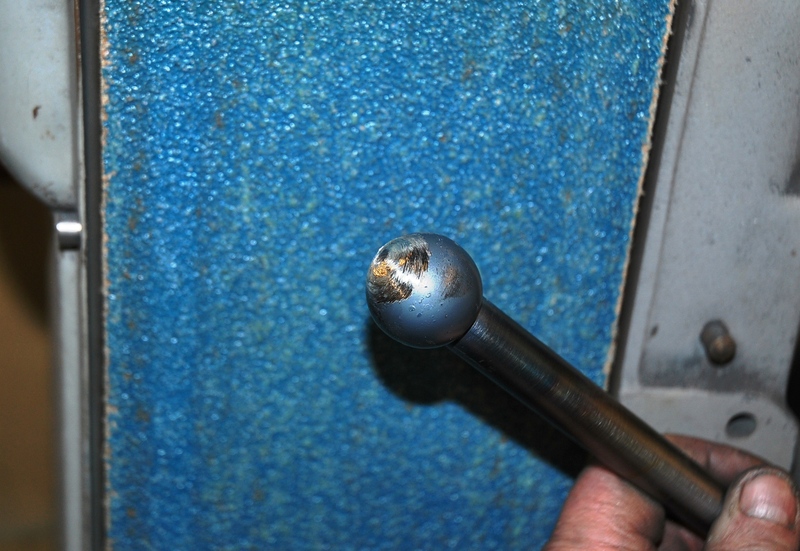 If you do bend this stuff, then you are using way too much pressure on your vise. The handle is turned with a smaller diameter on the ends. I like a 3/8″ diameter for any knob under 1″, 7/16″ diameter for knobs under 1-3/8″, and 1/2 inch for anything bigger. I also leave at least a 1/4″ extra for peening. 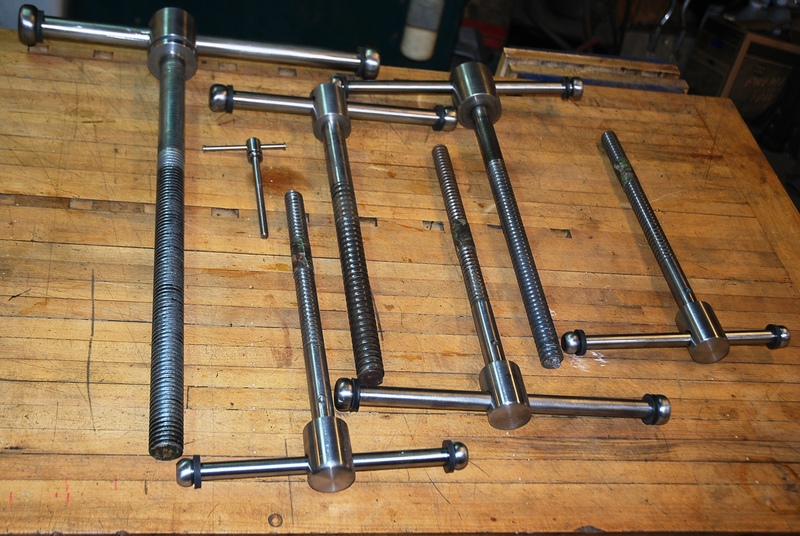 I studied handles from all the USA vise companies, and determined the most common method for peening the knobs on. I like to leave around a 1/4″ of peen material beyond the knob. Then I chamfer the knob pretty heavily for the peen material to fill. Another quicker method is to weld the knobs on. If I were in a hurry, I would choose TIG with no filler. 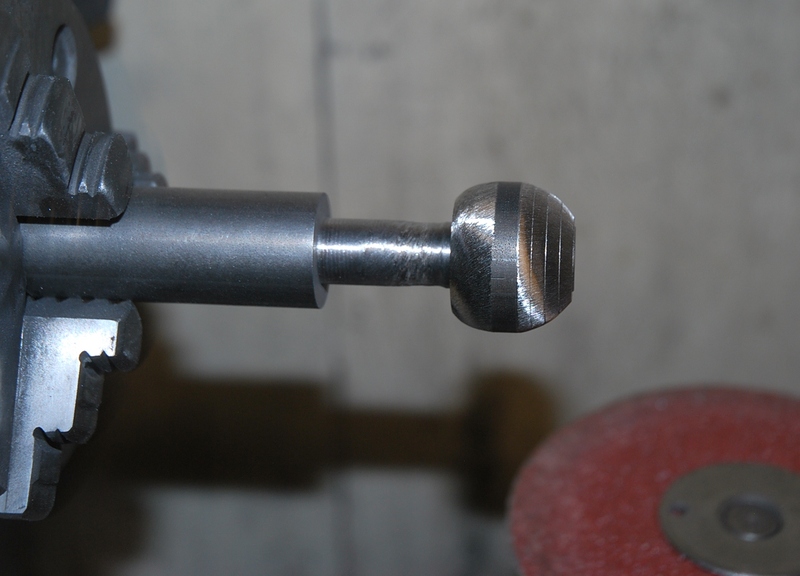 Making the knob is pretty easy, especially if you have a metal lathe. I have found it is easier to cut steps in the ball before sanding the ball smooth. The steps are cut to the arc of the radius. 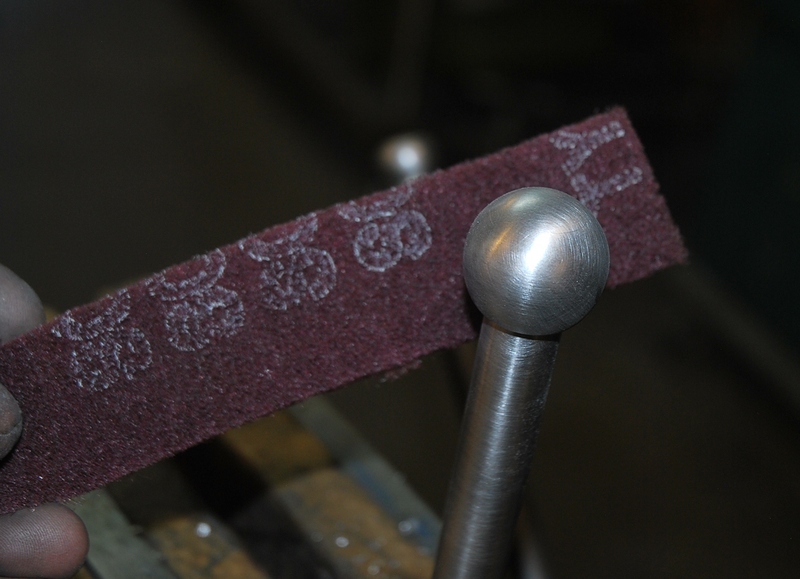 When you file, sand or grind the steps down to the cut lines from the lathe bit cuts has disappeared. Once I rough the front radius, the back radius is easy to match. I built a holding fixture to grab the knobs and I have it extended beyond a safe distance from the lathe chuck. Each knob is drilled and reamed for a precision hole and the fixture is machined and threaded for a flat head cap screw. 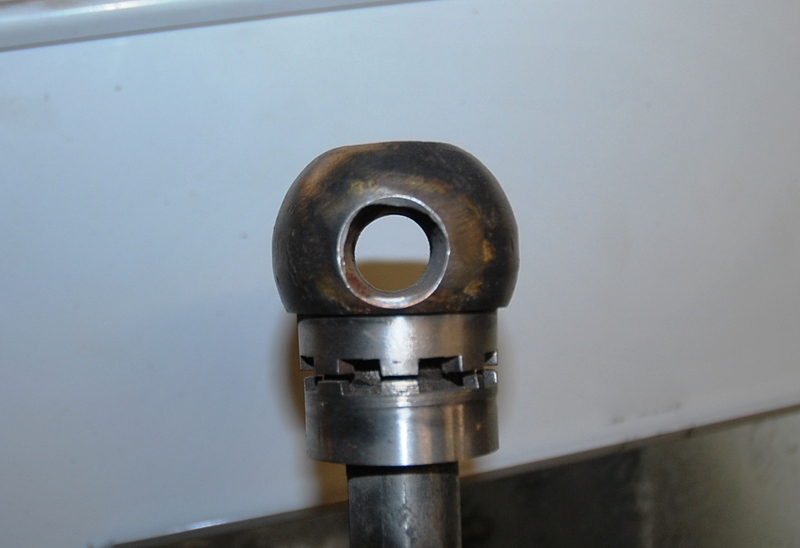 The knob is bolted tight and then easily worked into shape. When a customer receives their handle back from me, they will need to peen the opposite end after it is installed in their spindle. 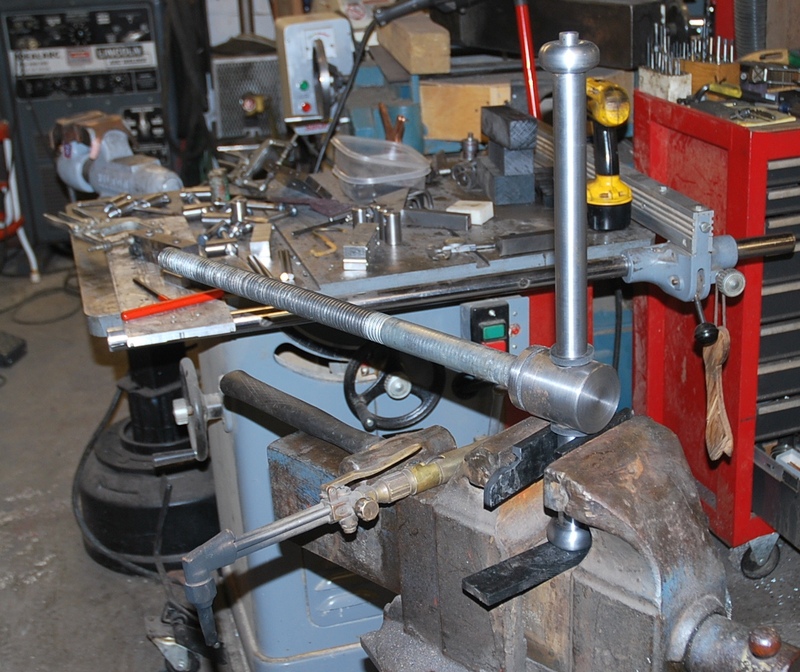 I use a 6″ vise with a square slider for the handle to rest while peening. I also use copper caps or a delrin pad to grab the handle without marring the finish. 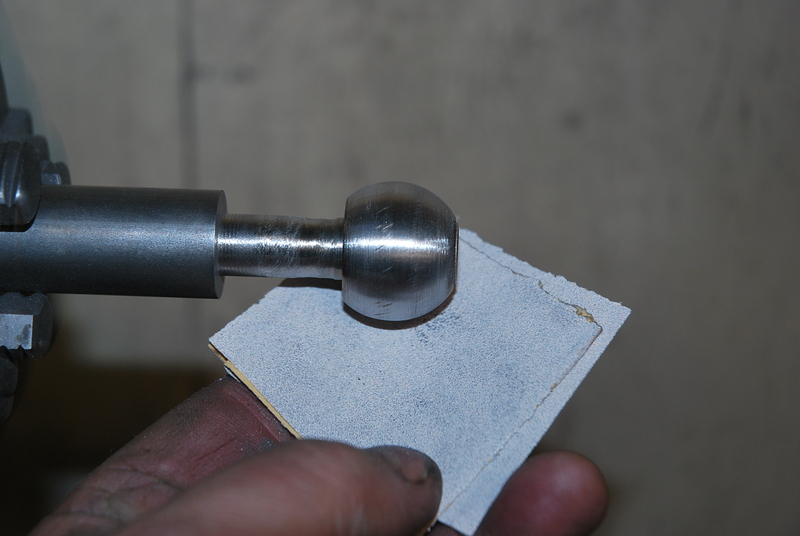 I also rest the finished handle on a piece of delrin, nylon or aluminum to save the finished knob from being damaged. 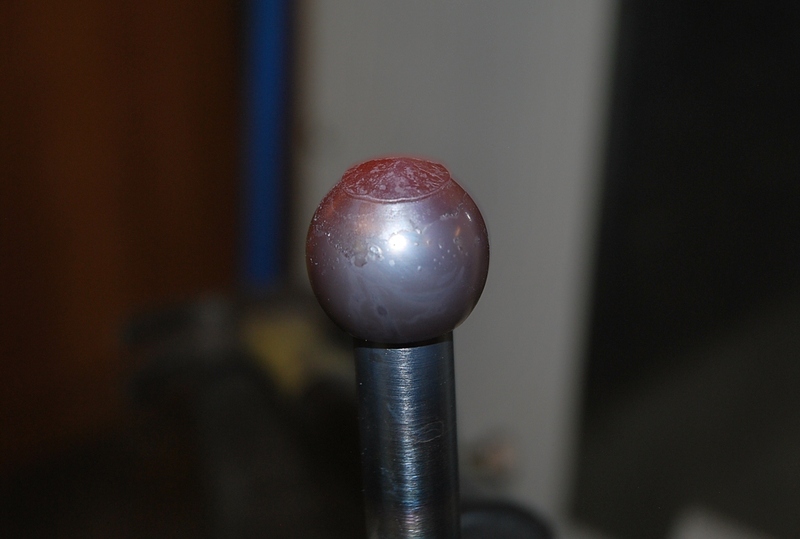 Next, I take my oxygen acetylene torch to heat the end before peening, I like to get it pretty red before hammering. I use a hammer that feels comfortable and easily swung. You do not need a big hammer because the red hot steel moves pretty easily. 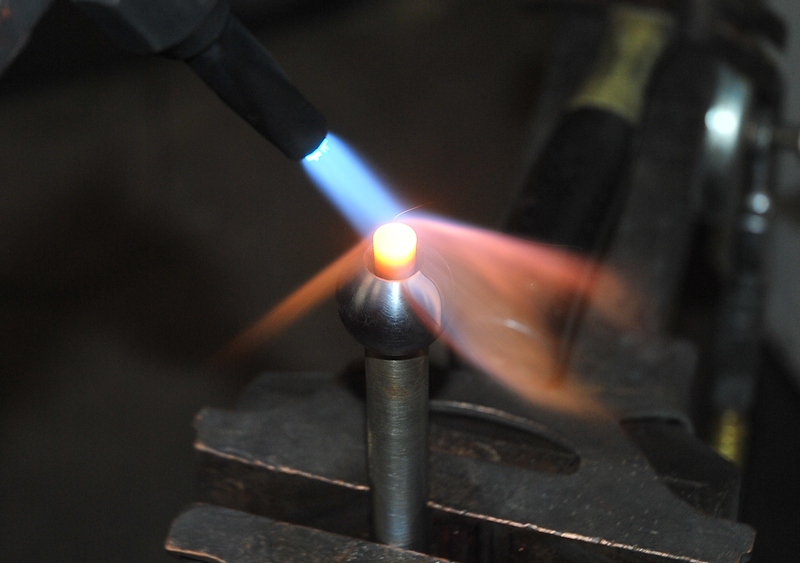 I like to keep the torch on the work the whole time while I am hammering, since this keeps the steel from oxidizing in the fits and the chamfer. 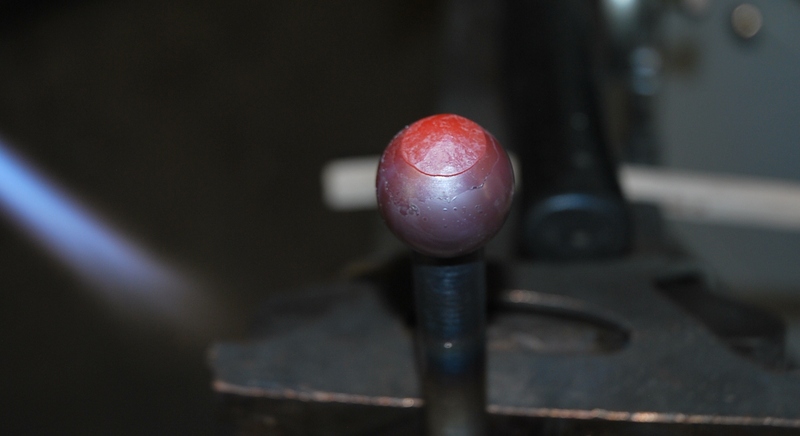 I tend to pound straight down and move the steel close then hammer at about a 15 degree angle all the way around the knob to form the steel to the chamfer real tight .If you haven’t forged before, it’s just a matter of patiently pounding and shaping until it looks the way you like. Don’t rush. 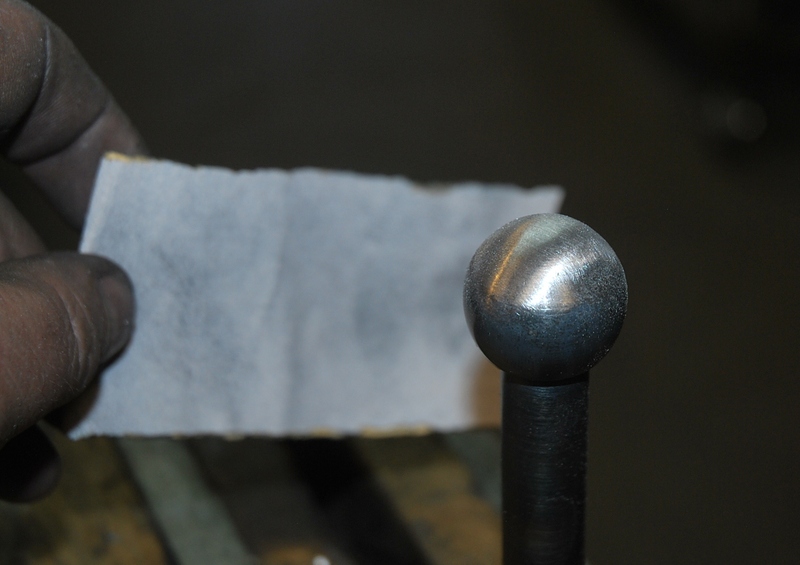 The pictures show the finished peening. 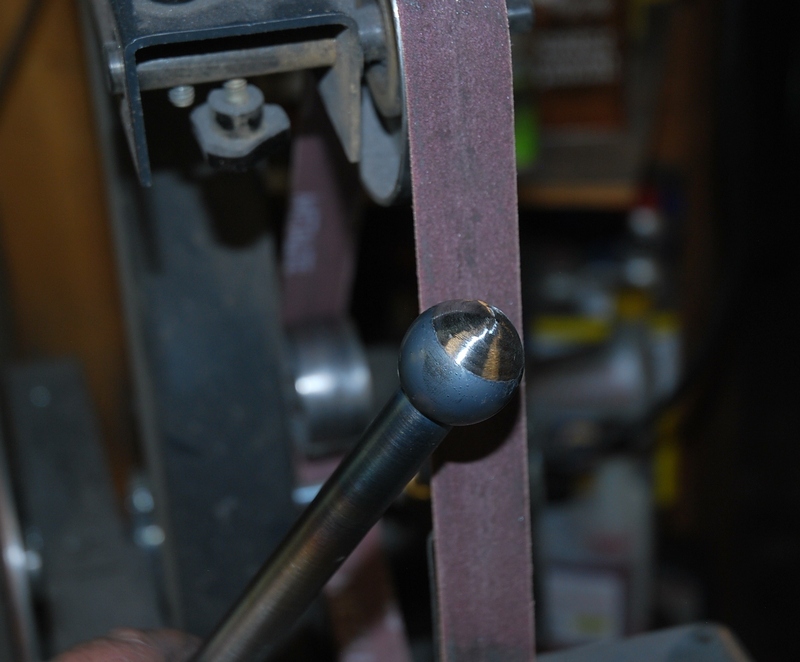 This is how I finish the knobs after they cool: First I rough grind the excess steel down with my 6 x 48 belt sander. Then I get closer with my 1″ wide ribbon sander. The rest is hand work on the bench. Using a DA gets the scratches off pretty quickly. Using a smooth file and then going to 120 grit sand paper, then finishing up with the Scotch Brite pad that I supply with the order, will get the same finish that I gave on the first knob. This is pretty much how I build handles. I also add a rubber bumper to all handles. I make these myself since I can not find a supplier that carries the ones I like. Give me a call if you have any questions, and good luck. This entry was posted in Handles. Bookmark the permalink. Do you have replacement lead screws? It’s .875, with about .160 lead. 18”.